Headquartered in Bray, Ireland, Design Partners is among the latest strategic product design consultancies to leverage the benefits of bringing 3D printing in-house. Having acquired two Stratasys Objet 3D printers from SYS Systems, an Objet30 and an Objet30 Pro, the company is enjoying shorter lead-times, greater project control and reduced costs, while clients benefit from faster reaction to design changes and shorter time-to-market. The 30-employee design consultancy, which also has a European hub in Eindhoven, partners with ambitious clients to help fuel their growth through story-led design experiences. Operating largely in three market areas consumer, healthcare and professional products the companys work is all about creating new artefacts and user experiences in a connected world.. And although Design Partners comes from a craft tradition and has a deep belief in making things by hand, the company deploys a number of different modelling techniques, which now include 3D printing. With Design Partners traditional process, parts had to be modified for CNC machining, entailing programming, planning and operator resources. Now, especially with having a second Objet 3D printer in-house, the company can simply send whatever it has at the end of the day to print, review it in the morning and factor this into the next days development. One of the latest projects to be prototyped using Design Partners Objet 3D printing capability was a tunable gaming mouse. Gamers play to win and require specialist equipment that can be tuned to their game. With this in mind, Design Partners brought tunability to new levels with a science-led approach to the design that makes the multi award winning Logitech G502 Spectrum Proteus the first of its kind. Providing tunability to weight and balance, the metal-wheel ratchet, programmable controls, DPI and surface tuning of the sensor; the G502 empowers gamers to fine-tune their abilities. The technological innovation of the G502 is embodied in its fractured, futuristic identity, which combines the forensic science of gaming with customisation where it matters the entire foundation of which was prototyped on the Objet 3D printers. According to Mr Lynch, the main factor in choosing an Objet desktop 3D printer was the material choice, resolution and the price point. The Objet30 Pro offers a range of eight different materials, including transparent and high-temperature photopolymers. Furthermore, a large tray size gets the most out of a small footprint. In short, the machine combines the accuracy and versatility of a high-end rapid prototyping machine with the compactness of a desktop 3D printer. Powered by PolyJet technology, the Objet30 Pro features the industrys best print resolution, allowing users to attain smooth surfaces, small moving parts and thin walls. With a roomy tray size of 300 by 200 by 150 mm, Objet30 Pro is ideal for prototyping consumer goods, consumer electronics, medical devices and more. From experience, Design Partners has found that 3D printing is unique in its ability to iterate quickly. For this reason, it allows the company to see fundamental mistakes, or sometimes to try things that should have worked and see why they need to be evolved differently. For all design projects, there exists a complex group of people who have to work together closely and effectively to ensure the final product can be mass produced. 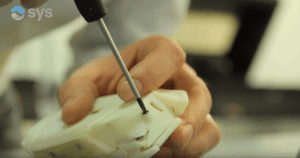 One of the best tools to help simplify and accelerate this process is 3D printing. The final word goes to Mr Lynch, who has some clear advice for any company thinking of investing in the latest 3D printing technology.